Lianne and Trevor are two friendly beekeepers with a love for our honey bees and life on the beautiful North Shore. 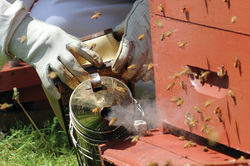 Our goal is to supply other beekeepers with fair priced, quality equipment and supplies. As well, we are happy to share our experiences and expertise with you. Two Bees Apiary is an online store pleased to accept cash, cheques, transfers, to be paid in full at time of your convenient pick up at North Vancouver Location. Once we receive your order you will be contacted to confirm pick up date and time at our convenient North Vancouver Location. We are pleased to accept cash, cheque, or online e-transfers, to be paid in full at time of Pick-up. ​If you wish to to use a credit card we will issue an invoice through Pay Pal. PayPal is one of the safest online ordering systems. They protect buyers with many security features. For more information please see PayPal​. There will be a 3.5% service charge for this service. We are not able to give credits or refunds for special orders or used merchandise. All returns must be within 30 days of purchase. Upon receipt of goods, please inspect it immediately and report any discrepancies or defects. Failure to do so may limit our ability to accept returns. If merchandise is defective, we will replace it. Please notify us immediately. Refunds will be subject to a 15% restocking fee. Prices are subject to change due to availability and shipping expenses. Our goal is to carry high quality equipment, goods and supplies. We have carefully sourced our suppliers in order to give you the best at the fairest prices. If you have any questions about our products please feel free to contact us.